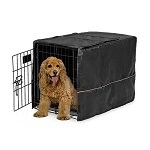 MidWest 30-inch Dog Crate Cover provides your pet with a quiet, private sanctuary of their own! The dog crate cover simply slips over the top of your dogs crate, providing your pet with a relaxing environment to sleep while you are home or away! 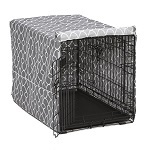 The dog crate cover offers proper ventilation and can be used with 1, 2, or 3 door pet crates, allowing entrance and access from multiple sides. The dog crate cover also allows access to the slide-out plastic pan in your crate for easy removal and cleaning. Brown Covella Dog Crate Coveris available in five sizes, Gray Crate Cover available in four colors which includes the 30-inch crate cover, and the Solid Black is available in six sizes. The Quiet Time Crate Cover will fit the most popular crates currently available at fine retailers near you. Normally ships next business day if your order is received by 3PM.